Male: Sleek bright yellow bird with long tail. Female: Like the male, but duller. Yellow Wagtails are summer visitors from the African continent and spend their summer in pastures, meadows, marshes, riversides and arable fields, and usually near freshwater. The male Yellow Wagtail has bright yellow underparts and face in the summer, with olive-green upperparts and black-brown wings. Female Yellow Wagtails are duller with much browner backs and very pale buff-yellow below. Juveniles are similar to the females but even duller and browner and with pale cheeks and a black necklace beneath the throat. They may be confused with Grey Wagtails but the Grey Wagtail has a much longer tail, grey upperparts and yellow-green rump. The most common call is "tsweep", and its song is a simple repetition of this call. 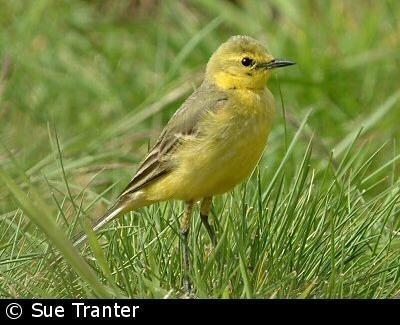 Yellow Wagtails can often be found around cattle and horses, feeding on the invertebrates, such as flies and beetles, that the livestock disturb with their hooves. The female builds the nest, which is either on the ground in a hollow or in thick grass. The nest is cup-shaped and made from grass, plant stems and roots, with a lining of hair or fur. 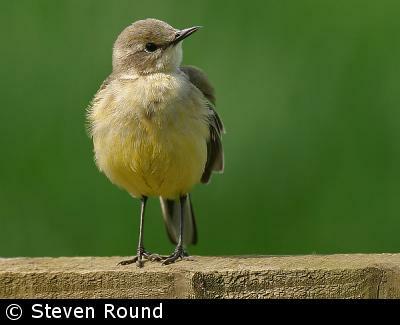 The eggs of the Yellow Wagtail are about 17 mm by 14 mm in size, and are smooth, glossy, and pale buff or grey with darker buff spots. The duties of incubating the eggs are performed by the female. The newly-hatched young are fed by both adults. The Yellow Wagtail is a summer visitor (March-September) that winters south of the Sahara, Africa. The breeding range of the Yellow Wagtail is contracting and their numbers have fallen by over 80% since the 1970s possibly through changes in farming practices. 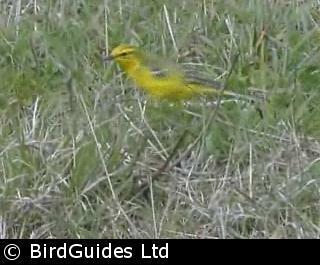 Consequently, the Yellow Wagtail is a Red List species of conservation concern.